Musings of a (mostly) Self-Taught Knitter: The growing stash. Do you remember when I decided to catalogue my stash last month? I never owned up to the total number (only the sock yarn), but it was clear I had more yarn than I would be able to knit up for quite some time. But we all know a knitters will-power is weak. The better the price, the weaker we get. And if the yarn is difficult to come by, well, there is no use trying to resist. So when MissyJoon e-mailed a proposition to me, I knew better than to try to resist. It seems she found a source for the Cotton-Ease she needed for Sitcom Chic. They have a minimum order of $40 and charge a flat $8 for shipping, so she thought I might like to go in on an order with her. Well, anything to help out a friend, right? My share of the loot arrived late on Friday. Since everyone raves about Cotton-Ease, I figured I'd better order some before I missed my chance to ever knit with it. I believe I have enough for two tank tops. Yes, I do want to cast-on right now, but I'm trying to hold out and finish my other WIPs. I can wear tanks all winter for ballroom dancing lessons and practice parties, so there really is no rush. Except that my willpower is weakening!! And what is that?? Why, it's some great extra stuff Missy threw in for me!! 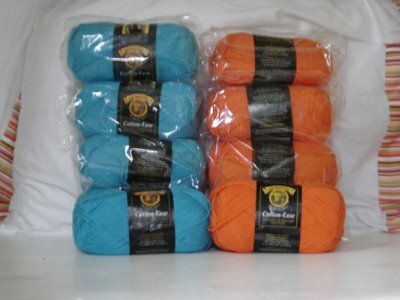 Actually, I had ordered the Bernet cotton, but it was supposed to be one skein of green and one of blue. Smileys made a little error, but I told Missy to just send me both green skeins, because they were going into the dishcloth stash anyway. 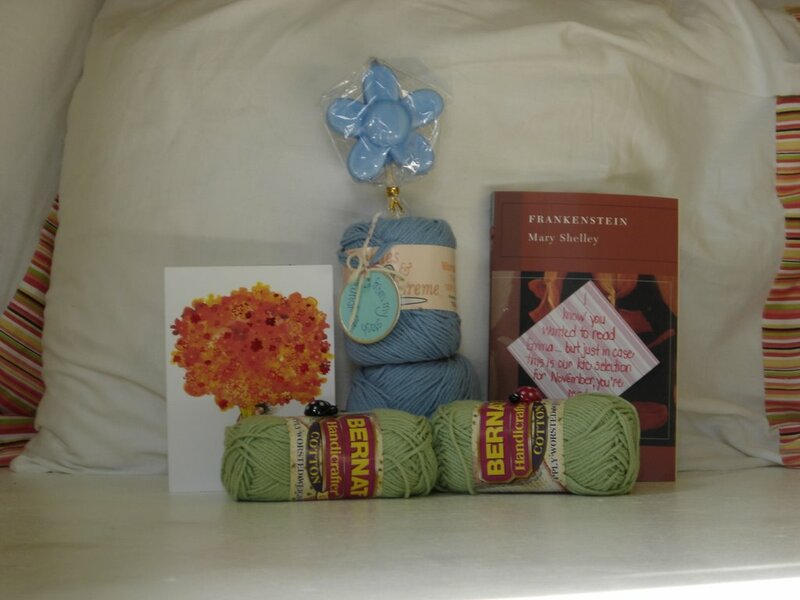 Imagine my surprise when I opened the box to see she gifted me with two blue skeins of Peaches & Creme from her stash, cleverly held together with a pretty blue flower candle!!! She also correctly predicted that Frankenstein would be the November choice for Knit The Classics and sent me a copy!! If you click on the picture to enlarge it, you might be able to see the adorable glass lady bugs she tucked in the box too. I have them on the desk where I work with my lap top, where I can see them often and smile!! All this plus a sweet card, it brought tears to my eyes. Please do make sure you go over and pay a visit to Missy's re-vamped blog at Persian Purls and Yarnovers. She is the very first person to every ask if she could hire me to do some graphics, and was one of the people who gave me the push I needed to give the graphics thing a go. I was so thrilled when she contacted me last month to let me know she was ready to get started. She was an absolute joy to work with, so be sure you visit her and leave her a comment to say hi. And don't forget to vote for her Amazing Lace entry too!! Oh yes, and I supposed I should mention that we are checking our calendars and making plans to ride the yarn bus in the near future too. I can just imagine what we'll end up adding to our stash that day!! Well you know you have to stock up when there are good deals because then you can get more yarn for your money. Missy is such a doll. The flower candle is so cute! Is that your graphics work on her blog, very lovely! I seemed to have come across that "source" myself! Only I had to fill the $40.00 minimum all by myself! I love the yarn bus! You can't pass up a good deal even if it means adding a little more to the stash and how nice of her to include exta goodies! The yarn bus sounds like fun! ooooh, good goodies! I did a yarn inventory a few months ago. 183 balls, hanks and skeins and that doesn't include what I've picked up this summer. :-o Clearly there is more to this yarn thing that knitting with it; we need to be surrounded by it! Plus who can pass up a good deal? I plan on buying several big plastic boxes in the next couple of days to replace the two big tv cardboard boxes my stash is in. I so want to try some Cotton-Ease one day but dunno if I will ever be able to get any. You got some very nice gifties there! Why should we feel like we have to apologize for our stash? Didn't the Girl Scouts teach us to "Be Prepared"? Well, I'm prepared. "will power" really refers to "i will do whatever it is that i know i'm not supposed to be doing" reaction, right? riiiiight. hee :) nothing like great stuff from knitty friends to make your day! Time to ask for some help. "Now listen here, Young Lady . . . "
Last weekend - with LOTS of pictures!!! A year and a day . . .
My sense of humor is warped.